Bernice and Sal had their first date at a popular spot on 2nd Street in Long Beach (my old home and favorite L.A. city), so we decided to head there for their engagement session. We had a great afternoon wandering around shops and visiting some of the places they enjoy. We found this really cute candy shop. I love all the colors. This is right in front of Shannon’s Bayshore, where they met for their first date. I love this shot. It was my favorite of the day. We had so much fun shooting their engagement session, and even more fun at their wedding. Wedding photos coming soon! Thanks so much to you both! Sweets! Great pictures specially number 7 Blue shoes, blue shirt and bue bike! Great session, loving the candy store! 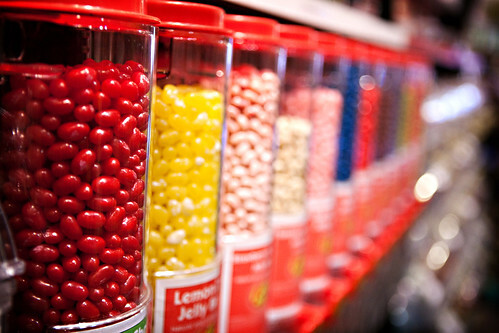 Candy store.. AWESOME location! My favorite shot is them walking down the street- the lighting is killer! Fun stuff Karen. 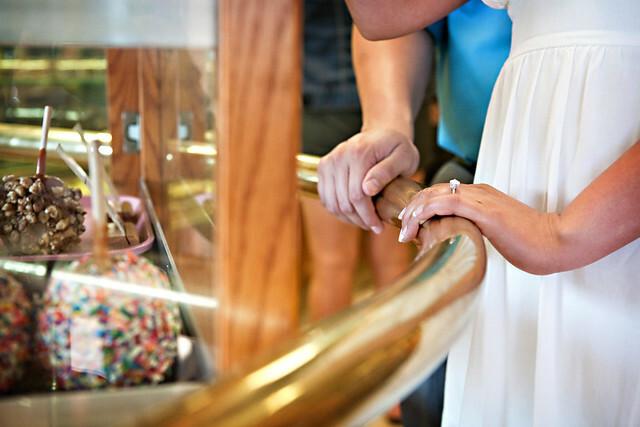 I’m loving those candy store shots! Loving the blue shoes and candy store background! Amazing pictures – the locations are awesome! What a seriously cool location. And I love that you shot them where they had their first date. That’s so special! Fabulous locations and great shots. I love that last one – it’s like a romantic postcard. Looks like you guys had lots of fun! Great shot of them kissing in the alley (and I love that her shoes coordinated with his shirt!). Last shot is my fave. Good work! I love the next to last shot – cool light! I adore that third to last shot! Wonderful work!